Colorado Parks and Wildlife will be offering a one-day, accelerated Bowhunter Education class from 8 a.m. to 5 p.m. Saturday at the Horsethief Canyon State Wildlife Area near Fruita, the agency announced in a news release. Participants must have already earned a hunter education card to be eligible to participate in the class, which is designed for bowhunters of all ages and ability. For novice archers, equipment will be provided, according to the release. In many states, passing a Bowhunter Education class is required before purchasing an archery license. 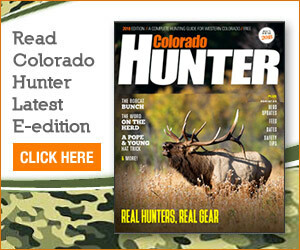 In Colorado, the class is considered an advanced hunter education course but is not required, the release stated. The Bowhunter Education card earned by successful students in this class is accepted anywhere in the world where it is required to purchase an archery license. Course topics include the bowhunter’s responsibilities, equipment, range estimation, hunt planning, tree stands, survival skills, basic first aid and many other useful archery skills, according to the release. Space is limited, and pre-registration is required. A $10 registration fee is required and can be paid on the day of the class, the release stated. Anyone interested should call (970) 255-6100 to register and to receive important information about the class. Participants are encouraged to bring water, insect repellent, sunscreen and a sack lunch, the release stated. To get to Horsethief Canyon State Wildlife Area, take Interstate I-70 to Fruita, get off the highway at exit 19 and head south to Kingsview Road. Turn west and follow the road for approximately 4 miles to the location.